Climate activists lock on to Bluewaters Powerplant in Collie, W.A. On Friday the 26th of June, two activists locked onto a conveyor belt at Bluewaters coal-fired power station near Collie, 3 hours south of Perth, W.A.. The action is to protest Griffin Energy’s decision to burn wood from WA native forests for energy production. 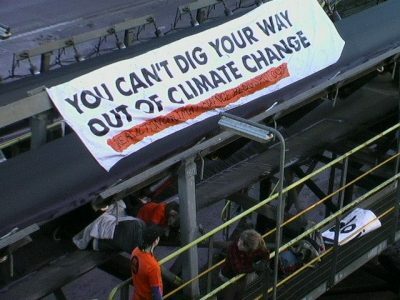 The two activists were arrested and later removed from the conveyor belt by police, after more than four hours of preventing coal from being fed into the power station. A third activist has also been arrested at the site. “The WA public has a right to renewable energy. Here we have an abundance of wind, solar and wave energy. CETO, a wave energy company, has chosen to be a part of this renewable revolution. Griffin also has the opportunity to join Western Australian businesses committed to sustainable solutions. There is no place for coal-fired power station or native forest logging in a sustainable WA,” said Ms Johnson. Griffin Energy recently won a tender from the Forest Products Commission (FPC) to buy between 250,000 and 400,000 tonnes of native forest logs a year. Our native forests provide the WA community with clean air and water, biodiversity, and homes for unique WA plants and wildlife. Native Forests also store huge amounts of carbon. After logging and burning, the carbon is released into the atmosphere. Globally, deforestation and logging contribute about 27% of all climate change-causing greenhouse gases. “Research in the eastern states shows that if native forests are left undisturbed, they can play a vital role in storing carbon and contributing to a climate change solution. “Instead of protecting them for their vital role in reducing climate change, Forestry Minister Terry Redman proposes to allow Griffin to burn native forest logs, thereby releasing massive amounts of GHG and accelerating run-away climate change. This is an atrocious distortion of a system that should be leading us towards a zero-carbon economy, not further away from it. “The people of WA will have to pay for Griffin’s reckless corporate behaviour long after its shareholders are done lining their pockets. So we will continue to disrupt the operations of organisations like Griffin for as long as they continue to display such corporate recklessness and short-sightedness. “At the same time we support the calls from the Australian Manufacturers Workers Union and the Australian Council of Trade Unions for a just transition to a renewable society that leaves no worker or community behind,” said Ms Johnson. We can help you with fundraising, tell you about transport options (train, hire car, hitching etc) and link you up with cool cats who are planning to use the same transport you are. The trip over often results in just as much learning as the conference itself 😉 And certainly can help folk meet others and form the type of bonds we need to feel comfortable working with each other to build caring, connected and environmentally just communities! WASEN mad skills in May! As activists we all need mad skills to rock the shaky foundations of oppression and destruction. 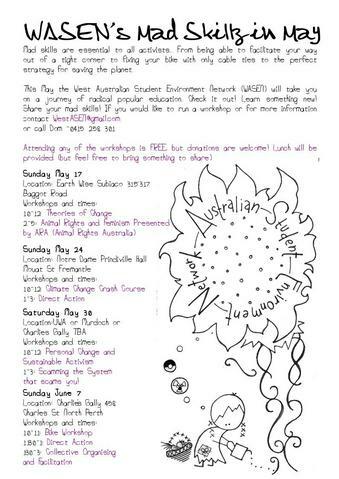 The West Australian Student Environment Network (WASEN) has been involved in skilling up the activist community, students, youngsters and older cats alike, in WA for a while now. Join us in May for our latest foray into the depths of radical activist education because we are all educators and we are all learning. This, on the surface is a series of 7 workshops, over 4 consecutive weekends. However dig a little deeper and you will find that it is part of a lifelong exploration into how we learn, how we learn to learn and how we learn to educate. 1-3: Scamming the System that scams you!